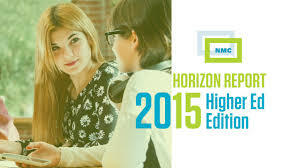 Helping trainer-teacher-learners place educational technology in a meaningful context remains one of the many strengths of the New Media Consortium (NMC) Horizon Project—a strength fully and engagingly on display in the Horizon Report > 2015 Higher Education Edition survey of how makerspaces and wearable technology are supporting positive learning opportunities in a variety of settings. Report co-authors Samantha Adams Becker, Alex Freeman, and Victoria Estrada go far beyond simply describing makerspaces (learning spaces where people, technology, and learning interact in creatively dynamic and innovative ways) and wearable technology (tech tools that can be worn to support learning and a variety of other endeavors). At the beginning of the makerspaces section of the 2015 Higher Education Edition, they remind us we are seeing a significant “shift in what types of skillsets have real, applicable value in a rapidly advancing world. In this landscape, creativity, design, and engineering are making their way to the forefront of educational consideration…” (p. 40). As we think through the need for and repercussions of developing new skillsets, we see that overtly working to develop the skills to effectively incorporate makerspaces and wearable technology into our training-teaching-learning endeavors is an often-overlooked part of our ever-evolving learning landscape. It’s not enough for us to simply enter a makerspace or put on the latest piece of wearable technology; we actually need and benefit from guidance in what these developments offer us and, more importantly, how we may have to rethink our approach to training-teaching-learning if we’re going to effectively incorporate them into our most stimulating and productive lifelong-learning efforts. Makerspaces and wearable technology, after all, have the potential to move us further away from a focus on lecture-based learning and closer to creatively-engaging experiential learning opportunities. 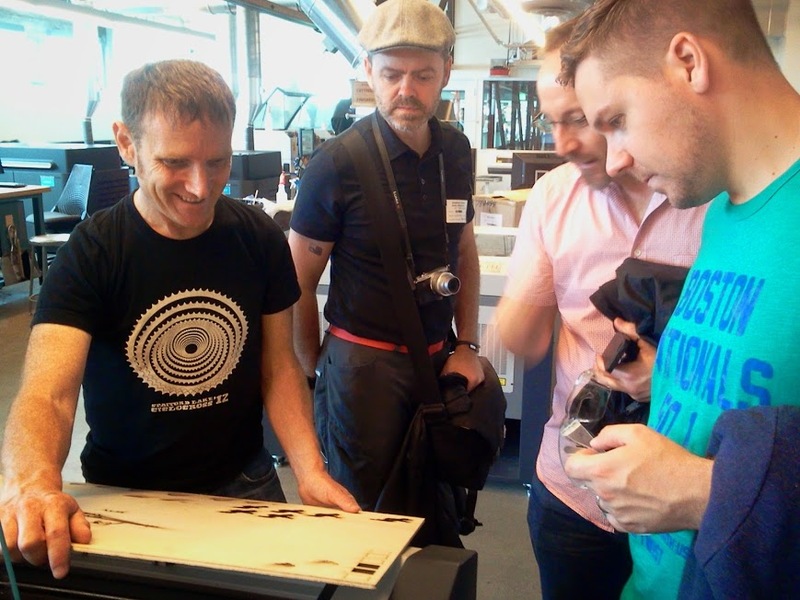 Walking into Autodesk’s high-tech makerspaces here in San Francisco several months ago with a colleague who had arranged for us to join a tour of the facilities, I was initially struck by the numerous unfamiliar tools on display and in use by those using the space. Although familiar with the expanding use of makerspaces in libraries, I had not yet had the opportunity to use a makerspace as a learning space. It didn’t take long for those of us on that Autodesk tour to move past the state-of-awe stage; through impromptu conversations with artist-learner-makers who were incorporating 3D printers, lasercutters, and other high-tech tools into their own learning and creative-production efforts, we began to understand what an engaging approach to learning and collaboration these spaces foster—something that would not have been so obvious and engaging without the guidance of Mark Gabriel, the Autodesk rep who was serving as an Autodesk intern when we were onsite. Our own learning-about-learning experience was, furthermore, tremendously supported by our onsite learning colleagues—the artists and others who contributed to our wonderful informal-learning experience by helping us take the first steps toward raising our own skill levels in ways that may eventually lead us to more active engagement in makerspaces wherever we encounter them. The need for that same relearning-how-to-learn guidance is obvious as we monitor and dive into the rapidly-changing environment of wearable technology and how that is going to affect our training-teaching-learning efforts. Watching (with admittedly great enthusiasm) the apparently inevitable move toward mainstream adoption of Google Glass—the 800-pound gorilla of wearable ed-tech—over the past couple of years made many of us involved in the Horizon Report expert-panel explorations last fall firmly place wearable technology in a two-to-three-year time-to-adoption horizon for higher education; we were already seeing numerous examples of how Google Glass prototypes were being incorporated into learning, and some of us were taking steps to hone the skillsets necessary to effectively connect wearable technology to training-teaching-learning. It was, therefore, a real Black Swan moment—that moment when we come face-to-face with something that had previously appeared improbable—when we read (shortly before the 2015 Higher Education Edition was released but long after the text for that report had been written and submitted for publication) that Google Glass in its current iteration was being pulled back for further development. There were the inevitable and completely predictable mainstream media stories and blog posts about how it had been clear that Google Glass was never going to work, and I was briefly among those who saw that two-to-three-year adoption-horizon rapidly slipping away (as horizons so often do in the extremely volatile world of ed-tech developments where today’s snapshot can unexpectedly fade, only to be restored later by additional Black Swan developments that make the improbably suddenly so obviously real). There were, however, new wearable-tech announcements within days of the announcement that Glass was being withdrawn, and a glance at the Tech Times website shows that wearable technology is not going to disappear in training-teaching-learning or other endeavors anytime soon. Our eLearning Guild colleague David Kelly, in fact, was quick to point out intriguing ways in which Glass, even at this point, can be seen as a success because of the ways it “opened minds” and “explored important questions”—which brings to our attention the most important skillset we need to continue developing: the skillset which helps us to look beyond the momentary successes and setbacks, the changes in specific technologies’ placement within one-year, two-to-three-year, and four-to-five-year adoption horizons, so we’re not completely flummoxed when a black swan lands in our learning nests. NB: This is part of a series of articles exploring the latest Horizon Report. Next: On the Four- to Five-Year Horizon—Adaptive Learning Technologies and the Internet of Things. This entry was posted on Tuesday, February 24th, 2015 at 12:32 pm and is filed under technology, training. You can follow any responses to this entry through the RSS 2.0 feed. You can leave a response, or trackback from your own site.